Resident Evil: Raccoon City Announced? The game takes place in 1998, a time where Resident Evil fans already know what's set to take place. The title lets you enjoy the series from a new perspective, as the men and women who are technically responsible for it all. Rather than continuing the zombie slaying antics of BSAA agents, you're taken back to the original outbreak "that underscored both Resident Evil 2 and Resident Evil 3: Nemesis." The game doesn't require any crazy amounts of knowledge of the past titles or characters involved in the series. The title opens up to a "quartet of new faces". Essentially, you're playing as members of the official Umbrella Security Services squad. Operation Raccoon City is a team-based shooter allowing four members of the USS team to destroy all evidence of the ongoing outbreak. Along with slaying the zombies, you're looking to "kill pretty much every survivor possible". The gameplay is described as "dirty", and the series will feel much darker than it has up to this point. The game features three factions that Capcom has stated make up a "three-corner conflict". The other two factions are the US Spec Ops, who are there to repel the USS, and the "bio-organic weapon monsters (BOWs) created by Umbrella. The USS team is made up of the following characters: Vector, Beltway, Bertha, and Spectre. Depending on which character you choose, the responsibilities that you're asked to do within your team will variate. Hunk, first seen in Resident Evil 2 as a hidden character, is the inspiration behind the USS team. 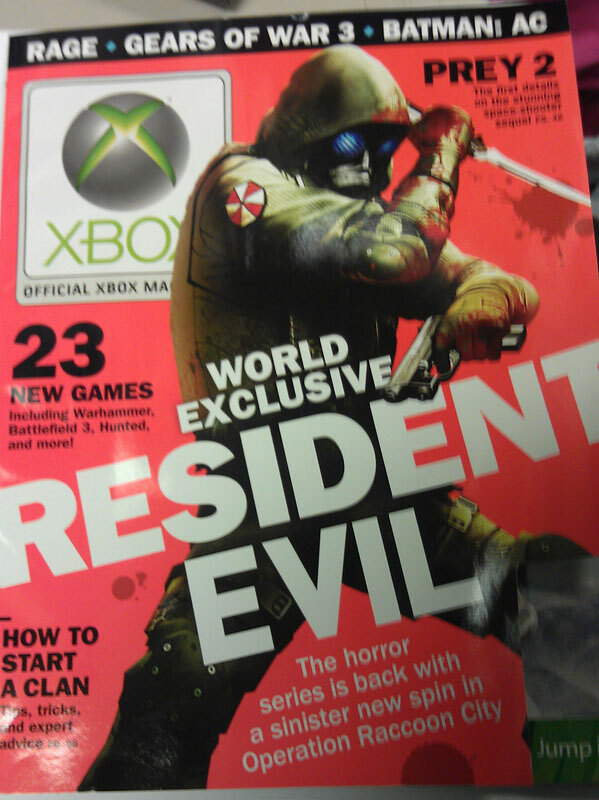 "Whichever team you play on, you'll be facing Umbrella-created horrors in between skirmishes with each other". Zombies in the game can sense you in three different manners: sight, sound, and smell. A situation is described in the game where Vector cloaks himself to stir up previously slumbering zombies to use against the Special Ops military foes. Quite a few scenarios in the game aren't "all about headshots". A quote in the article states, "It's about shooting the other soldiers - manipulating the, making them bleed." The game will take you through a number of familiar areas if you're a Resident Evil junkie who remembers your journey to Raccoon City. Operation Raccoon City, depending on how you play the game, will give you the option to "change the history of Resident Evil". Not only will you have the chance to meet and interact with various characters from the series, but you'll even have the opportunity to kill them. One of th mottos repeated to OXM throughout the demo was "Kill Leon". It's also stated that if you choose to represent in the game as the Special Ops team, that you'd more than likely have the goal of trying to save Leon Kennedy. Slant Six or Capcom won't reveal if any other characters will be playable in the title just yet, but it'd make sense to see quite a few big cameos. The title will still see players relying on collecting herbs to heal from any attacks you may suffer. You won't need to hoard any herbs, but they'll still benefit you to collect them throughout the game. "This is not a one-versus-one game where you've got one clip full of ammo and zombies on you. If you've ever thought of those times in an RE game when you thought, 'I'd wish I had a big gun', that's what this game is. It's not fair to give people big guns, then take all the ammo away." One of the pictures in the article showcases a zombie being used as a "meatshield". Operation Raccoon City allows players to earn XP for kills, with these points helping you survive the onslaught, and to help to encourage you to anihilate everything in your path. The XP will allow you to earn new abilities, such as Vector's cloaking skill, and new weapons. Tyrants will most definitely be included in the title. Really not sure what to think about this. It doesn't sound very Resident Evil-ish at all, and I'm a bit skeptical with the SOCOM developers developing. Similarly, I hope that this somehow turns out like a spiritural successor to Outbreak. We've needed something like that now with our currently technological climate.